The Cyperus Sedge has strings of spiky green tassels which hang from long stems above lush strap like green leaves in early summer. They give it an exotic appearance, however it is native and needs space to impress. It is also good at hiding unsightly liners, but not really suitable for small ponds or water features. 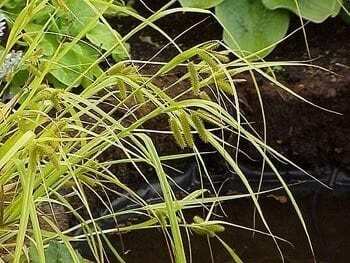 This sedge can be used as a marginal, but is equally good planted in moist or boggy soil or as a waterside plant. Organically grown in peat free compost. Prune back hard in spring, not autumn. Can be plant in water depth to 30cm/12in (obviously don’t drown the plant by submerging it while in growth!). Propagation by division or seed, both are equally successful.